Polish skincare brand Ziaja have introduced a new natural oils collection – an ultra-replenishing natural based face and body care collection that harnesses the topical power of essential fatty acids (Omega-3, Omega-6 and Omega-9) for keeping your skin in shape. These powerful beauty nutrients, sourced naturally from argan, avocado and grape seed oils, will nourish and protect your skin throughout the winter. The topical application of omegas can boost lipid levels in the skin, improving overall skin softness and elasticity. 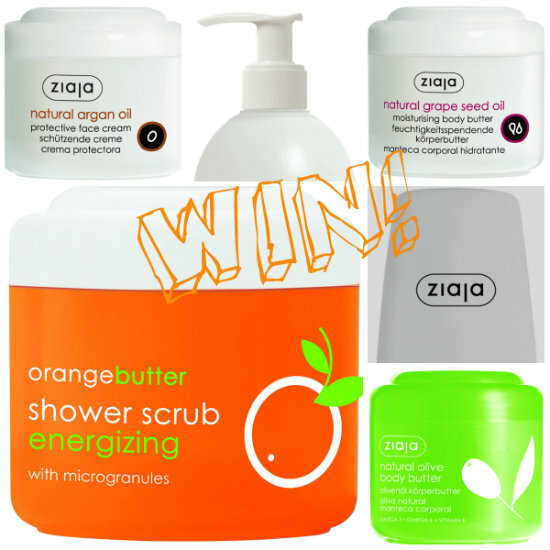 Aaaand…I have a €50 hamper for one lucky winner – resident in the Republic of Ireland - with a selection of products from Ziaja’s natural collection. Outside Ireland? There are two international giveaways currently running on the site – check them out here and here! Get entering now to be in with a change to win – and best of luck, everybody! Have used this years ago when I was young & foolish & skin care was not priority,love to give it another go!! I've never heard of this brand, but I love the bright packaging! This stuff looks lovely and fresh Em and their packaging is very attractive .. I've never heard of Ziaja but online reviews look good! I've always wanted to try this brand! I love Ziaja - great prize!